In my recently designed game www.sodokogame.com I mentioned Euler’s “36 officers problem” as the driving force. In this article I propose to say a little bit more without using Combinatorial Mathematics, as I too have difficulty in grasping this. I will explain by means of necessary diagrams. First we must know what is a LATIN square and what is a Graeco-Latin square ( also referred to as Euler squares ) as the latter was the basis of the “36 Officers Problem” . A LATIN square is an n x n table filled with n different symbols in such a way that each occurs exactly once in each row and exactly once in each column. 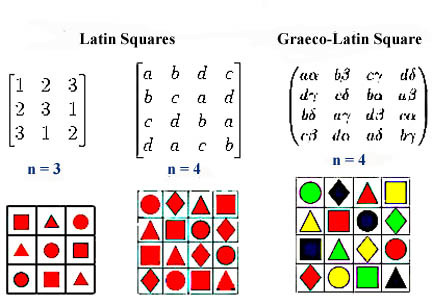 A GRAECO-LATIN square is also an n x n table, each cell of which contains a PAIR of symbols, composed of a symbol from each of 2 sets of n elements. Each PAIR occurs exactly once in the table. Each SYMBOL in the 2 sets occurs exactly once in each row and exactly once in each column. Another way of defining is as follows. When two Latin squares are constructed, one with Latin letters and one with Greek letters, in such a way that when superposed, each Latin letter appears once and only once with each Greek letter, the resulting square is called a Graeco-Latin square. In the image above we see 2 LATIN squares and 1 GRAECO-LATIN square in letters and below I have represented them in colors, for easy understanding and that is the manner I will use for the remainder of this article.